When it comes to traveling in Pennsylvania, there are many amazing places to visit. 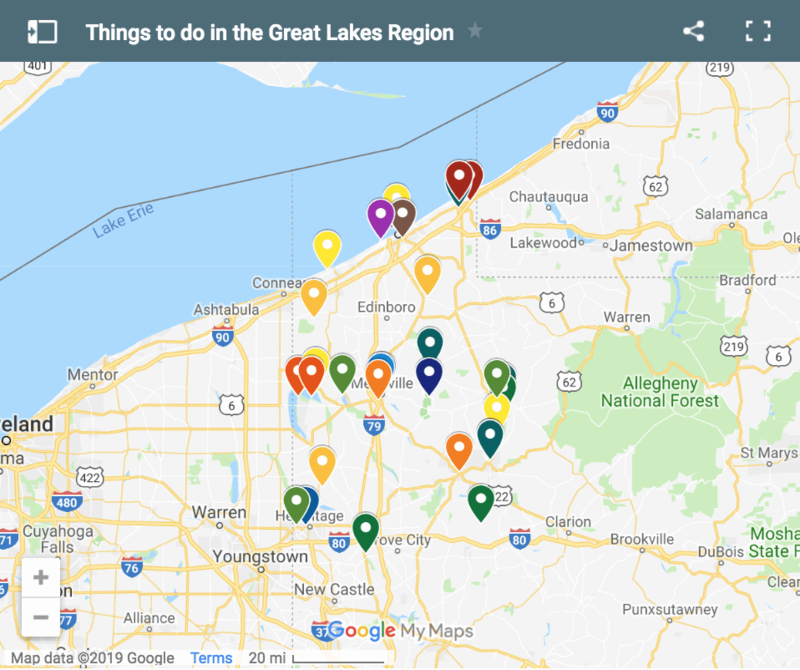 From Philly to the Pennsylvania Wilds, and Pittsburgh to Gettysburg, there’s a bit of something for everyone. However, many of the smaller counties around the state get overlooked by visitors. Take Venango County, Pennsylvania, for example. 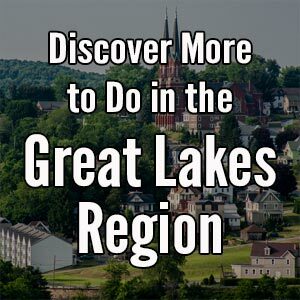 Situated in the northwestern corner of Pennsylvania, the county occupies an area of the state that’s often ignored by visitors to the nearby cities of Pittsburgh and Erie. However, the county’s natural beauty, wonderful small towns, and fascinating history make this a fantastic place to visit. 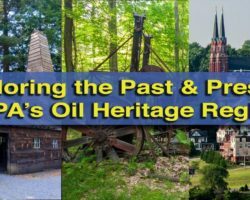 Visiting the Drake Well Museum in Venango County is a great way to learn about the area’s oil history. This might sound surprising, but outside of Independence Hall in Philadelphia, the site of the Drake Well in northern Venango County might be the most historically influential site in Pennsylvania. That’s because it was here that the world’s first commercial oil well was dug. Visiting today, it’s hard to fully comprehend the enormous impact this discovery has had on the world. The site is home to a large museum that talks about the history of oil production, as well as recreations of Drake’s well and equipment. This is definitely a place you should visit at some point during your travels in Pennsylvania. Click the link to find out more and see my full review about visiting the Drake Well Museum. DeBence Antique Music World is home to one of the area’s best collections of antique musical apparatuses. 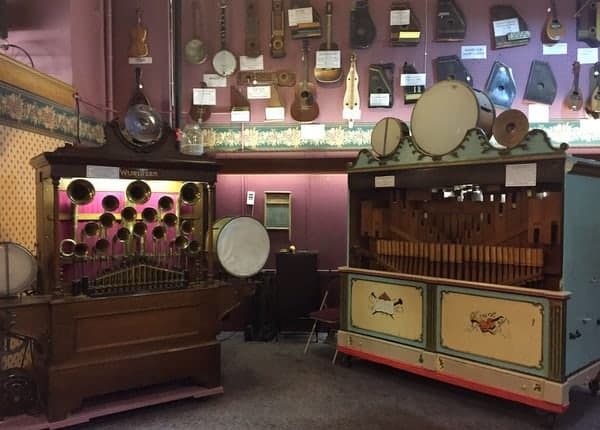 Home to dozens of fully-restored, antique self-play instruments, DeBence Antique Music World in Franklin began as a private collection, but is now open for visitors to the region to enjoy. Take a tour through the history of self-playing instruments and enjoy listening to some of the strangest and rarest musical contraptions of the 19th and 20th centuries. For more information, check out our article on DeBence Antique Music World in Franklin. Pithole was an oil boom town that has now vanished save for a small museum. Pithole is a ghost town that was home to as many as 20,000 residents during its short existence. The town sprang up as an oil boomtown, and collapsed nearly as quickly as it began. 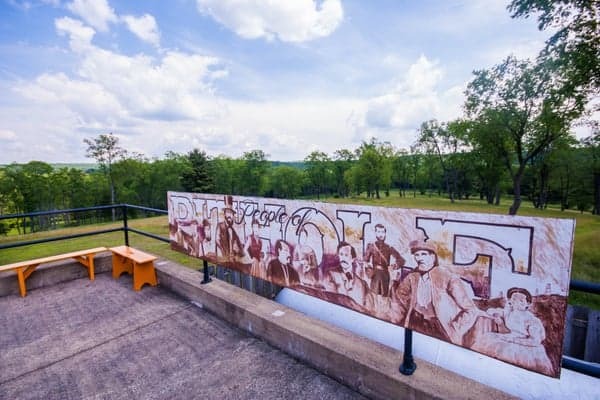 Today, little evidence remains of the town, but a visitor center has been built on the site with a museum, video, and diorama showcasing the history of the community. The old town’s streets are also maintained as walking paths so that visitors can walk through the field that now occupies the town’s location. For more information about visiting Pithole, head over to the website for the Drake Well Museum. The Petroleum Centre Walking Trail in Oil Creek State Park. 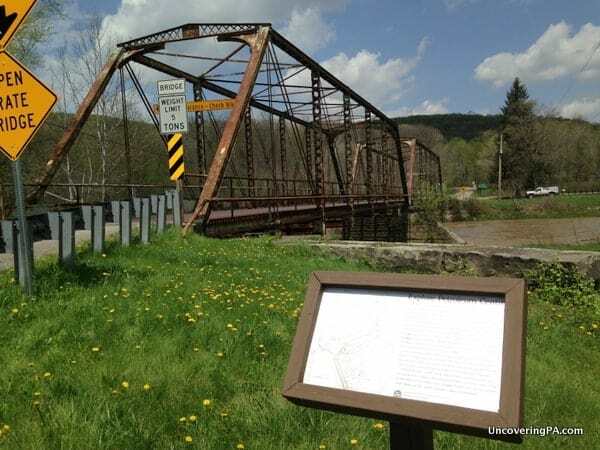 Located in northern Venango County, Oil Creek State Park is one of the most historically important parks in all of Pennsylvania. It was in this valley, along Oil Creek, that the modern age of oil drilling began. This led to several boom towns like Petroleum Centre. Located near where the Oil Creek State Park Visitor Center is located, this town went bust nearly as quickly as it went boom. A walking tour with more signs than ruins explains the history of this town once described as the “Sodom and Gomorrah” of the Oil Region. 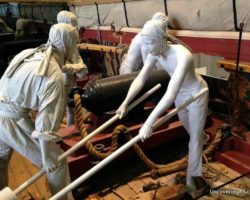 While there isn’t much to see, the history of the town is very fascinating and definitely worth taking half an hour to learn about if you’re visiting the park. 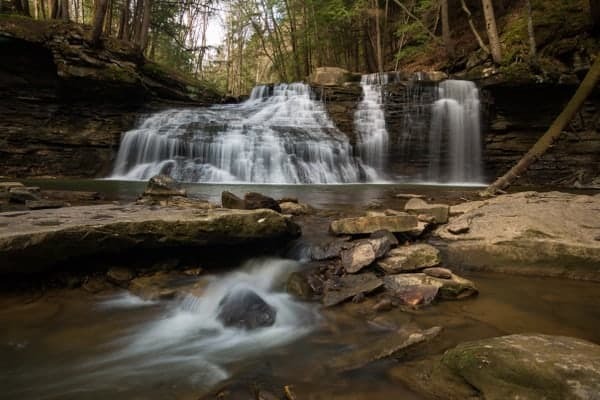 Miller Falls in Oil Creek State Park is worth checking out if you love natural scenery. In addition to the history, the park is full of some wonderful hiking trails and a handful of waterfalls. 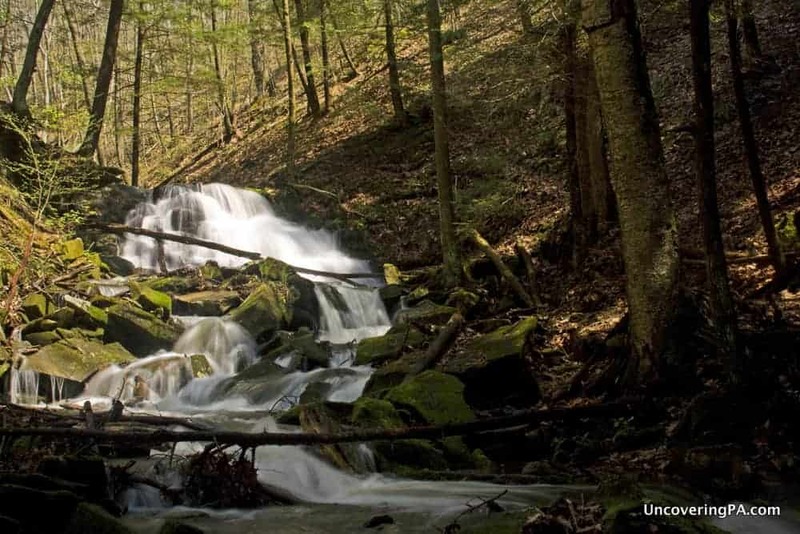 The easiest of these to reach is Miller Falls along the Gerard Hiking Trail. However, even when walking to this natural site, you can’t escape the park’s history, as old oil equipment dots the landscape along the trail. 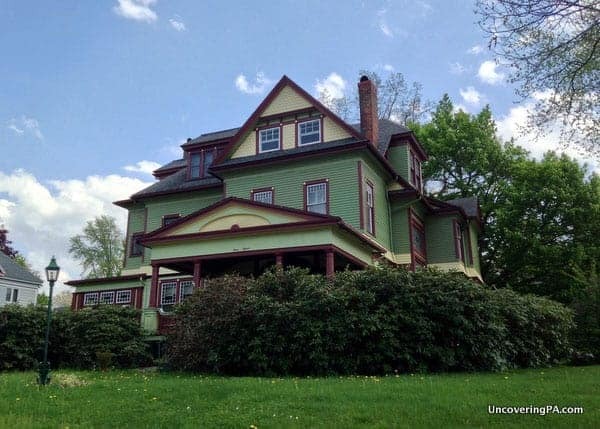 A beautiful Victorian home in Oil City’s South Side. Driving into downtown Oil City, I was instantly impressed. The town’s close association with the region’s oil boom has left an indelible mark on the city’s grandiose architecture. Old Victorian homes line the streets of Oil City’s Historic South Side. Walking or driving tour maps are available at several places around town and take you past many of the most beautiful homes in town. The brochure does a nice job explaining the history of the homes, with an emphasis on their architecture. 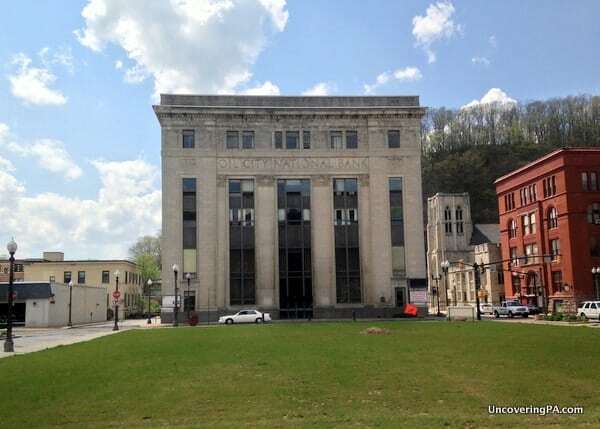 The Oil City National Bank Building in downtown Oil City, Pennsylvania. Even if you don’t have an interest in 19th-century architecture, driving through the town is a must for anyone in the area. It’s interesting to see how the city has revitalized many parts of downtown in what could have been a dying part of the state. Freedom Falls is one of the most beautiful waterfalls in western Pennsylvania. Freedom Falls might be one of the most unique and beautiful waterfalls in all of Pennsylvania. Located in a rural area north of Emlenton, this waterfall is roughly twice as wide as it is tall and is located a short hike from the roadway. Just a few hundred feet downstream from the waterfall is the beautifully preserved Rockland Furnace, which was once part of the area’s industry. Today, it sits abandoned and in remarkably good shape, save for some unfortunate graffiti. For more information on visiting the area, check out my article about how to get to Freedom Falls. The Venango Museum of Art, Science, and Industry in Oil City. The Venango Museum of Art, Science, and Industry in Oil City, Pennsylvania, tells the story of the oil industry and its effect on both the region and the world. The museum focuses on the time after the discovery of oil and walks visitors through what life was like in the region and how the oil industry changed throughout the decades. 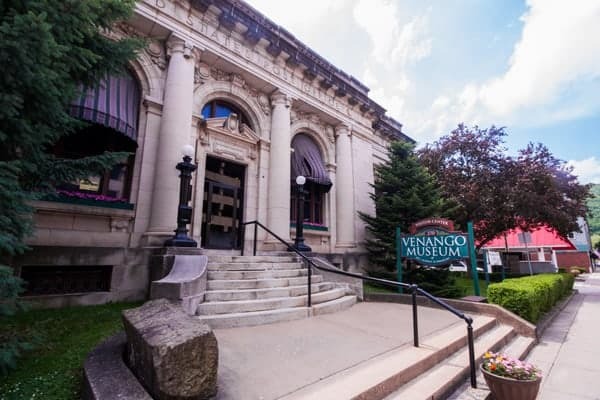 For more information, check out my article on the Venango Museum. The view from the Kennerdell Overlook in Venango County, Pennsylvania. Pennsylvania has hundreds of great overlooks scattered around the state, but I’ve seen few that are better than the view from the Kennerdell Overlook near Kennerdell, Pennsylvania. 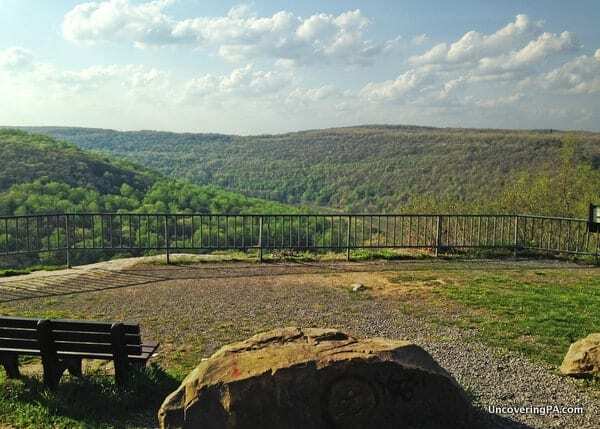 The Kennerdell Overlook provides excellent views of the serpentine Allegheny River below, as well as the Kennerdell Tract of Clear Creek State Forest on the river’s far bank. The small area has a couple of benches, as well as two signs telling you a bit about the area’s history. There is also a great view from a large rock next to the overlook, but use caution if you head over to the rock, as there are no railings. Kennerdell Overlook is located far above the Allegheny River Trail, but` it is possible to drive right up to it. The parking area can be found at the following GPS coordinates: 41.280041, -79.825326. McClintock Well #1 is the oldest, still-producing oil well in the world. 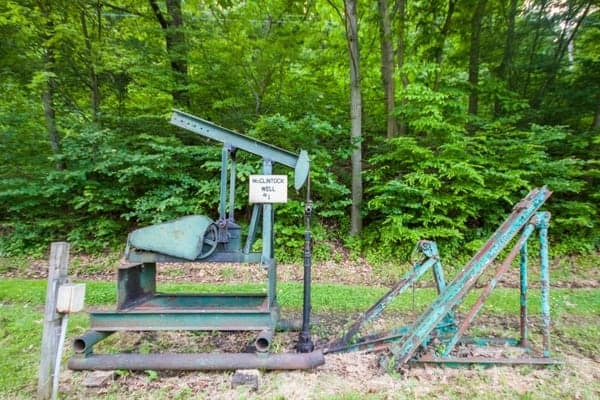 Venango County isn’t just home to the the beginnings of the oil industry, but it’s also still home to a small bit of the oil industry. Located just north of downtown Oil City, McClintock #1 has been producing oil since it was first dug in 1861. Today, it doesn’t pump every day, but it still works enough to maintain its status as the world’s oldest, continually operating oil well. Just outside of Emlenton is another historic oil well. Crawford #3 in Mineral Springs Park is claimed by some to be the oldest continually operating oil well, but it was dug in 1867. 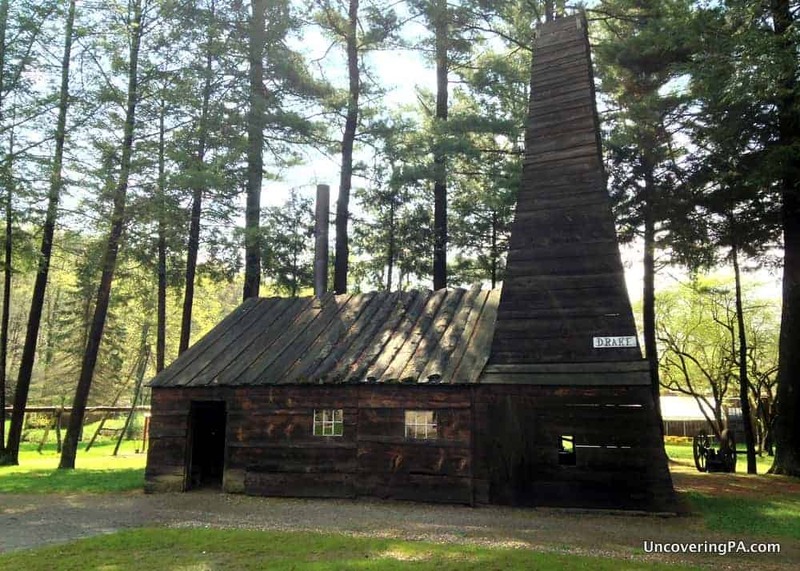 However, it was one of the first oil wells dug by the company that would eventually become known as Quaker State, giving it another interesting place in world history. A small portion of the beautiful Tiffany stained glass windows inside Franklin’s St. John’s Church. St. John’s Church in Franklin might be one of the most amazing churches in all of Pennsylvania, but few know of its claim to fame. What makes this church so special is that it is one of only seven churches in the world with a full set of Tiffany stained glass windows. 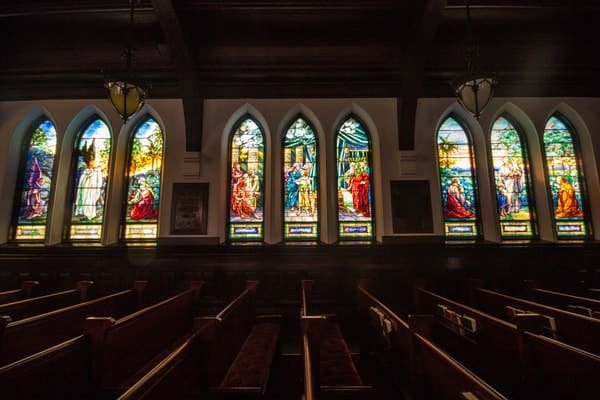 Seeing these windows is a sight to behold, and it’s amazing to learn about the masterful techniques that went into creating the windows in this church. Self-guided tours are allowed, but getting a guide offers great insight into the meaning and significance of these works of art. More information about visiting can be found on the church’s website. Belmar Bridge near Franklin is one of the highlights of the Allegheny River Trail. 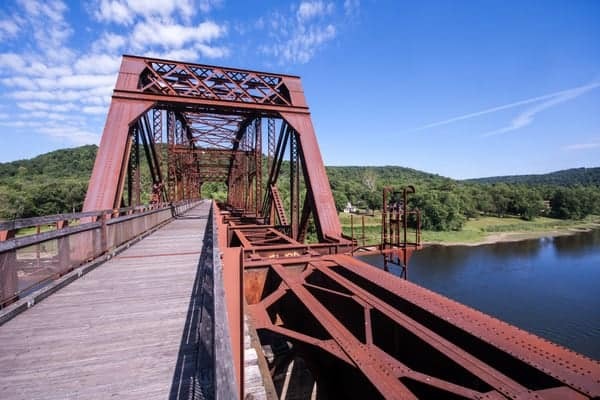 The Allegheny River Trail is a biking and walking rail trail that runs 32 miles from Franklin to Emlenton following the path of the Allegheny River. Along the way, it passes over bridges and through tunnels that once carried oil to the world. This trail will hopefully become part of the 270-mile Erie to Pittsburgh rail trail that is currently being completed in segments. Rail Trail enthusiast can also enjoy biking through Oil Creek State Park on their 9.7 miles of trails. For more information on the Allegheny River Trail, visit this website. 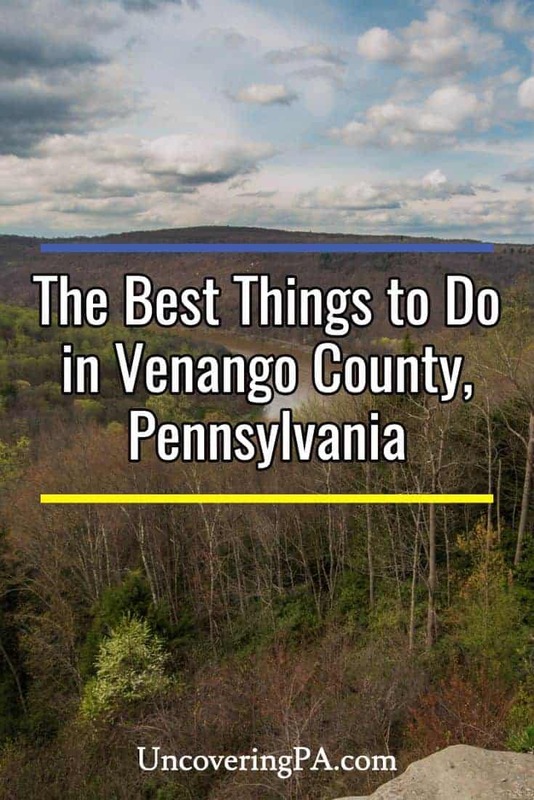 What are your favorite things to do in Venango County, Pennsylvania? Let me know in the comments below. I live here! There are some beautiful and interesting places in Venango county for sure. It was very cool seeing your article about my small hometown, not many people know it exists! Of course there are more than were mentioned. The old railroad tunnels that were repurposed for our bike trail that snakes from Franklin to Van, as well as down through Kennerdell. Also the beautiful city of Franklin and all of it’s monumental history. The best waterfalls like Freedom and Potter Falls are also a must. There definitely are a lot more places to visit in the county, Alexis. 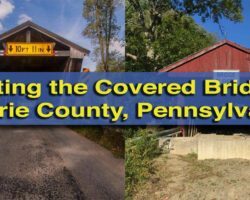 I can’t wait to visit again and come up with five more reasons to visit Venango County! My parents grew up in PA. (Rouseville & Van) My family visited Venango County many times when I was growing up. Thanks for the interesting article. I live here. It’s a great place. I go to school in Franklin. But don’t forget about the Hamer roads we have don’t here. I know of 3 places in Polk, PA and Barkeyville, PA. There are so many things to do around here if you like playing out doors. I live in Barkeyville. I enjoyed going back in time to see the places I visited and worked while growing up in Venango County. My husband and I used to take our horses and trail ride thru the Oil Creek area before it became a Park. I like going home in the fall and seeing the mountains in all there fall colors. Thanks for sharing these pictures. There is so much beauty in this area! It’s killing me! Someone PLEASE go to Ministers Creek Trail head! As a kid, I thought it was the most magical hike and beautiful view. I’m dying to find out if that’s a kids point of view, or is it really gorgeous! Please! I need pictures!!! I’ll keep it in mind for the next time I’m up that way, Vicki. Thanks for the suggestion! Drake, with the help of Billy Smith, drilled the well and struck oil at 69 feet. They didn’t dig. Well casing, pipelines and tank cars all derived from the oil boom. Saved a lot of whales too. Jim, I’m so glad you visited Vernango County and especially the town of Emlenton. The people in this town are special; they are quite accomplished and committed to the well-being of the town and those who live there. Next time please visit the Barnard House B&B where my father grew up with his 8 siblings. There’s quite a history there also. Thanks for all your posts! One of my all time favorite spots in Venango County is the Allegheny trails. Love the bits of history that they have of along the trail. The Venango County Courthouse is one of the highlights to see. Thank you for showing some of my favorite places in my new town of Oil City in Venango County. I am one of those relocated artists and I live and work in a mission styled house in Oil City. I came from Brooklyn, but other artists came from all over the country. This is a wonderful beautiful place and I love waking up every morning to see what new adventure will happen. On your next trip through Venango County, you should do a canoe trip down French Creek through Utica. It is a cute little town and the fishing is good. In Franklin, you should explore Debence Antique Music Museum, the parks, Barrow Civic Theater, and Sibley Mansion. I’m so lucky to have grown up in the area. Thanks for the suggestion. I’m hoping to get back up that way soon and will keep that in mind. This Siverly girl loves this! I live here in Oil City in Venango County and I think the whole county is very awesome. I also have some favorite places to go to for many memories but they are off the beaten track. one of my favorite spots is going up to the water tank on the southside eastend of oil city an just enjoy the view from way up on the hillside looking down upon the city. You just reminded me that I did that as a kid when visiting Emlenton with my father. Great article. I grew up in the area and love to go back to visit. I still think it is one of the prettiest place around. I lived in Rockland from 1932 to 1953. My dad and mother bought a farm there. William and Ethel Graham. I like being there, a lot of work but so many places to see. I have seen all the places you said about in Venango Co. A very good place to see everything. Mom and dad moved away in 1958 and I still miss the farm. Hope you make it back to the region. The Kennerdell Overlook is one of the most beautiful attractions to see. Rockland is so peaceful and a great place to capture amazaing photos. grew up in petroleum center loved it work in NY now but have a cabin in Tidioute and go to the valley as much as possible. 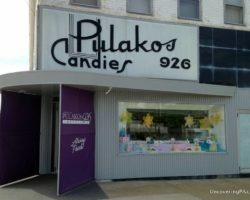 introduced my wife,kids and grandkids to it they love it too.. too bad they chased us out we would still be there. when they say you can never go home they are right .burned and buried a lot of memories. Ya you missed out on Franklin. Should really check it out if you like Venango. If you like history, the ghost town, Pithole is another. Plus Polk, it was once the largest asylum in Pa. The Center is still there. And French Creek between Utica and Franklin is pure primordial country. Did I mention the “real” Johnny Appleseed once came throw? We celebrate it every year during Apple Fest here in Franklin. Lots more great things to do for sure. I’m hoping to get back up to Venango County soon to explore them. Thanks for the suggestions. Just found this site. Hope for some new Ideas. For Vicki – Minister Creek is awesome! Don’t have pictures – only in my mind but I LOVE, LOVE that hike. Since Drake’s well is in Titusville doesn’t that make it in Crawford County not Venango? It has a Titusville address, but it is technically just over the boarder in Venango County. It’s a common mistake that most don’t realize. I have to return some day. Thank you for sharing my “Hometown.” Born , raised, graduated from OCHS, and returned nearly every year after moving away. We live in Texas now, and immediate family gone from the area, so not returned recently. We had it all in that wonderful town which makes for great memories. We could walk most places. Our summer vacations from school could be filled with “playground” activities provided by the school district and parks recreational programs. I could write much more, but that may bore people. Again, “thank you” for sharing.